A color enhanced, de-blurred still frame of the foam strike, derived from video recording (Credits: NASA). 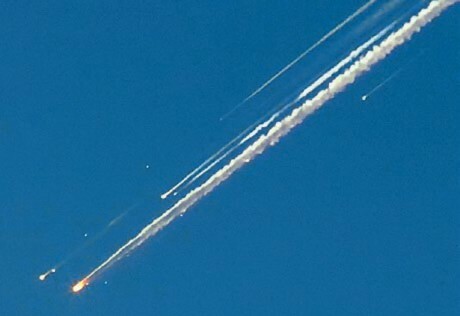 The Space Shuttle Columbia disaster is one of the most tragic chapters of spaceflight history. This article presents a technical overview of the accident, its cause, and the post-flight consequences. The Space Shuttle Columbia STS-107 was launched on January 16, 2003 at 10:39 a.m. Eastern Standard Time. 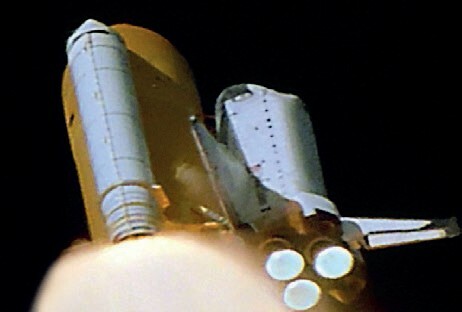 At 81.7 seconds after launch, when the Shuttle was at about 20,000m and traveling at Mach 2.46 (2,655km/h), a large piece of insulating foam came off the External Tank (ET) left bipod ramp area, close to where the orbiter attaches to the ET. The foam impacted under the leading edge of the left wing at 81.9 seconds. This incident was not seen by anyone on the ground or in the Kennedy Space Center (KSC) Firing Room or Johnson Space Center (JSC) Mission Control Center (MCC); there was no onboard indication to the crew. The impact was detected the next day during the detailed review of all launch camera photography that is conducted after every Shuttle launch. The analysis revealed that the debris was approximately 53-68cm long and 30-45cm wide, tumbling and moving at a relative velocity of 670-922km/h at the time of impact. Neither the crew nor MCC were aware that on flight day two an Air Force Command review of radar tracking data detected an object drifting away from the orbiter, that subsequent analysis suggested may have been related to the foam strike. On flight day eight, MCC emailed the crew that post-launch photo analysis showed External Tank foam had struck the orbiter’s left wing during ascent. MCC stated there was “absolutely no concern for entry” because the phenomenon had been seen before. MCC also emailed a short video clip of the foam strike. Columbia continued its 16 day mission without further incident – until Entry Interface. – In the video below, the apparently trouble-free launch of Columbia STS-107. On the second day of the mission, the Intercenter Photo Working Group Chair contacted the Shuttle Program Manager for Launch Integration at KSC to request imagery of Columbia’s left wing on-orbit. The Program Manager agreed to explore the possibility – this was the first imagery request of the mission. A Debris Assessment Team (DAT) was formed with NASA and contractor engineers. DAT contractor engineers prompted a NASA Shuttle manager to make a second imagery request. The Department of Defense (DoD) Manned Space Flight Support Office began implementing the request, albeit with the assurance from MCC that this was merely information gathering, not a formal request for action. The first formal DAT meeting was held on January 21st, five days into the mission. 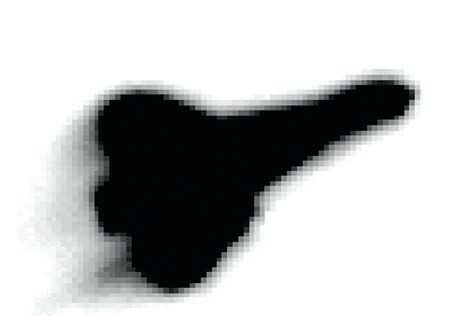 A trajectory analysis that used a computational fluid dynamics approach to determine the likely position and velocity histories of the foam (Credits: NASA Ref  p61). Without additional on-orbit pictures, the DAT was restricted to using a mathematical modeling tool called Crater, that predicts the depth to which debris will penetrate a Thermal Protection System (TPS) tile. Crater was suitable for small debris impacts, on the order of 49cm3 – versus 19,665cm3, the estimated size of the bipod ramp foam. Crater was classified as a “conservative” tool based on its projections of ice projectile damage to RCC turning out to be more severe than that achieved experimentally. Because foam is less dense than ice, the DAT used a qualitative extrapolation of the test data and engineering judgment that a foam impact angle of up to 21° would not penetrate the RCC. The assumptions and uncertainty incorporated in this analysis were never fully presented to the Mission Management Team (MMT). The DAT assigned the NASA Co-Chair to pursue a request for imagery of the vehicle on-orbit – constituting the third request for imagery – by going through the Engineering department rather than through Shuttle Program Managers. The imaging request was viewed by Shuttle Program Managers as a non-critical engineering desire rather than a critical operational need. Seven days into the mission, a NASA Headquarters Safety and Mission Assurance (S&MA) manager called a JSC S&MA manager for the Shuttle Safety Program and the Associate Administrator (AA) for S&MA, to discuss a potential DoD imaging request. The JSC manager for Shuttle Safety program said he was told this was an “in-family” event – meaning it was normal and nothing to worry about. The AA for S&MA stated that he would defer to Shuttle management in handling such a request. Despite two safety officials being contacted, safety personnel took no actions to obtain imagery. After discussion with other MMT members, the Shuttle Program Manager cancelled the DoD imagery request. The MMT had concluded this was not a safety-of-flight issue, apparently confusing the notion of foam posing an “acceptable risk” with foam not being a “safety-of-flight” issue. MMT members were making critical decisions about TPS damage tolerance based on little or no knowledge. A frame from a tape recording taken by the crew 4 minutes before the breakup (Credits: NASA). Columbia reentered the atmosphere with a breach in the Reinforced Carbon-Carbon (RCC) left wing leading edge near Panel 8. This breach was a main cause of the accident, since it allowed super-heated air, estimated to be about 2,760°C, to penetrate behind the TPS, destroying the insulation that protected the leading edge support structure and melting the aluminum wing spar. This resulted in thermal degradation of structural properties of the left wing. At Entry Interface (EI) plus 555 seconds, video from the ground shows pieces of material shedding from the orbiter, which continued to fly its pre-planned flight profile. Later, over the Dallas-Fort Worth, Texas area at about 60,960m, the increasing aerodynamic forces caused catastrophic damage to the left wing. At EI+613s, when the super-heated air had penetrated to the outside of the left wheel well, and destroyed the four hydraulic sensor electrical cables, controllers on the ground saw the first anomalies in telemetry data. At EI+727s, Mission Control noted an increase in left wheel well hydraulic line temperatures. At EI+790s, the two left main gear outboard tire pressure sensors began trending upward, then off-scale low. At EI+834s, a sharp change in the rolling tendency of the orbiter occurred along with additional shedding of debris. In an attempt to maintain attitude control, the orbiter responded with a sharp change in aileron trim, likely due to wing deformation. 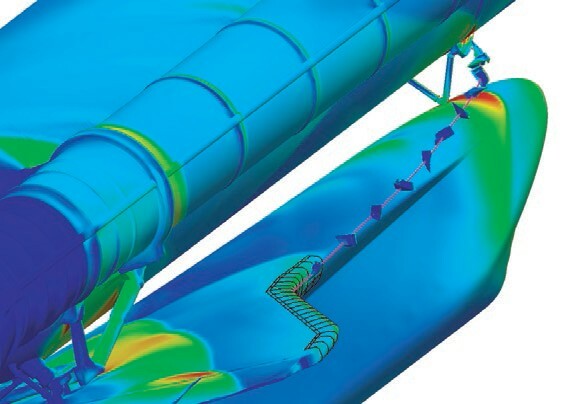 At EI+917s, the data showed a significant increase in positive roll and negative yaw, an indication of increased drag on and lift from the damaged left wing. 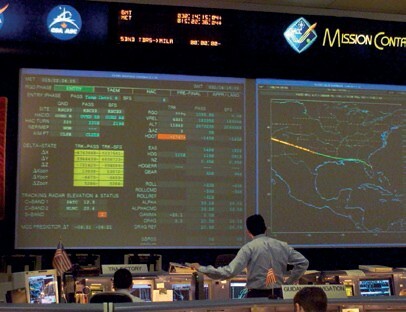 The shuttle flight control room in Houston’s Mission Control Center at JSC right after flight controllers lost contact with the Space Shuttle Columbia (Credits: NASA). The flight control system attempted to compensate for this increased left yaw at EI+921s by firing two aft right yaw Reaction Control System (RCS) jets continuously. By EI+927s, the third RCS yaw jet began firing continuously and at EI+928s the fourth and last right yaw RCS jet began firing continuously. It is probable that hydraulic pressure to the aero-control surfaces was lost at EI+928s when hot plasma burned through all four hydraulic lines in the area of the left wheel well. This loss of control and beginning of orbiter pitchup marks the transition from a controlled glide to an uncontrolled ballistic entry with orbiter aero-thermal breakup at EI+970s. Failure of the crew module resulted from the thermal degradation of structural properties, which resulted in a rapid catastrophic structural breakdown rather than an instantaneous explosive failure. Separation of the crew module assembly from the rest of the orbiter likely occurred at the interface with the payload bay. The crew module, pressurized compartment, and outer forebody separated at EI+1004s. Debris assessment indicates that cabin depressurization probably occurred when the lower cabin structure impacted the forebody structure. Increasing aero-thermal loads resulted in the total destruction of the crew module and forebody by EI+1021s. From data and analysis it appears that the destruction of the crew module took place over a period of 24 seconds, beginning at an altitude of approximately 42,672m and ending at 32,000m. The death of the crew was due to blunt force trauma and hypoxia (Ref  pp 70-77;  pp 1-63, 72). – In the video below, an analysis of the reentry of Columbia. According to CAIB, destruction of the crew module took place over a period of 24 seconds, beginning at an altitude of approximately 42,672m and ending at 32,000m (Credits: NASA). NASA commissioned the Columbia Accident Investigation Board (CAIB) to “conduct a thorough review of both the technical and the organizational causes of the loss of the Space Shuttle Columbia and her crew on February 1, 2003.” To capture lessons learned for future vehicle design, the Space Shuttle Program (SSP) commissioned the Spacecraft Crew Survival Integrated Investigation Team (SCSITT). “The SCSIIT was asked to perform a comprehensive analysis of the accident, focusing on factors and events affecting crew survival, and to develop recommendations for improving crew survival for all future human space flight vehicles,” (Ref  p xix). “The physical cause of the loss of Columbia and its crew was a breach in the Thermal Protection System on the leading edge of the left wing, caused by a piece of insulating foam,” CAIB reported. CAIB found that the design of the orbiter left no possibility for a crew to survive given the resulting conditions. Once the breach occurred, the crew’s fate was sealed. But there were plenty of opportunities before the breach occurred to have prevented this tragedy. CAIB cited “the organizational causes of this accident,” stretching back before the Shuttle program even began: “original compromises that were required to gain approval for the Shuttle, subsequent years of resource constraints, fluctuating priorities, schedule pressures, mischaracterization of the Shuttle as operational rather than developmental, and lack of an agreed national vision for human space flight.” CAIB particularly called out a NASA culture that accepted mission success over engineering understanding, the stifling of differences of opinion, and evolution of an informal chain of command (Ref , p 9). 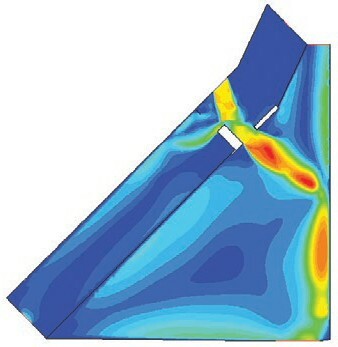 Computational fluid dynamics analysis of the speed of the superheated air as it entered the breach in RCC panel 8 and travels through the wing leading edge spar. The darkest red color indicates speeds of over 6,400 km/h; temperatures likely exceeded 2,760 degrees Celsius (Credits: NASA Ref  p69). The same organizational causes were cited with reference to the Challenger accident. “By the eve of the Columbia accident, institutional practices that were in effect at the time of the Challenger accident – such as inadequate concern over deviations from expected performance, a silent safety program, and schedule pressure – had returned to NASA,” (Ref , p 101). Sally Ride, who was on both the Rogers Commission Challenger investigation and the Columbia Accident Investigation Board, stated she was surprised at how similar the cause factors were for both accidents. The tile losses went directly against the Space Shuttle’s original design requirements that precluded foam-shedding by the External Tank. Engineers stated that had they known in advance that the ET was going to produce the debris shower that occurred during Columbia’s first launch in 1981, they would have had a difficult time clearing it for flight. As we now know, from 1981 until the accident there was ET foam shedding to various degrees on every flight (Ref  p 122). The CAIB noted that while there is a process for conducting hazard analysis when the system is first designed, and a process for reevaluating them when a design is changed or a component is replaced, no process addressed the need to update a hazard analysis when anomalies occur. The CAIB identified 14 In-Flight Anomalies (IFAs) that had significant TPS damage or major foam loss. “Space Shuttle Program personnel knew that monitoring of tile damage was inadequate and that clear trends could be more readily identified if monitoring was improved, but no such improvements were made,” CAIB stated. The process for closing IFAs was not well documented and appeared to vary. Had the correct information been available, it may have led to a concern by NASA management and engineering about ascent debris damaging RCC (Ref ; ). A view of Columbia taken at approximately 7:57 a.m. CST upon reentry as it passed by the Starfire Optical Range at Kirtland Air Force Base, New Mexico. Note debris coming from the left wing (bottom) (Credits: SOR/NASA). The Space Shuttle was grounded following the Columbia disaster and did not return to flight until July 26, 2005. In the intervening two and a half years, the ET TPS was redesigned and capabilities for detecting an impact were installed: video cameras on the solid rocket boosters and ET feedline, high speed cameras at the launch site, aircraft mounted cameras and radar, and an impact sensor mounted on the backside of the wing’s RCC and nose cap. 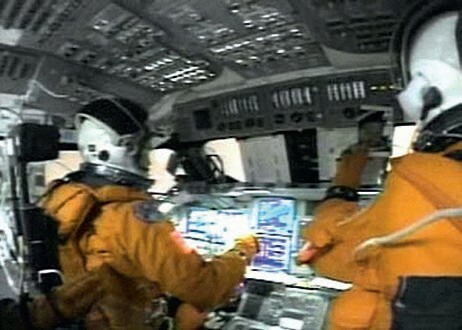 The crew of STS-114 was instructed to inspect their vehicle for damage and equipped with a limited repair kit to deal with the damage if they found it. Meanwhile, NASA was working on its safety organization. The agency established the NASA Engineering Safety Center (NESC) at the Langley Research Center, charged with providing independent engineering safety assessments and testing, and funded by the Headquarters Office of Safety and Mission Assurance to assure independence (Ref , p xxiv). A Chief Safety Officer for Space Shuttle was established, and S&MA began using analytical tools for risk characterization and trade studies. S&MA developed the capability to support real-time operations and for rapid team response to significant events or anomalies, as well as detailed Shuttle Probabilistic Risk Assessment models. S&MA and the SSP made a concerted effort to maintain and continually improve the risk-based decision making process. This effort was carried out through the end of the Space Shuttle Program and in that time avoided the decline and atrophy that occurred post-Challenger (Ref ). Left: the External Tank’s bipod fittings covered by foam ramps, as flown on the Space Shuttle Columbia. Center and right: the redesigned fitting (Credits: Lockheed Martin/NASA Michoud). Columbia Accident Investigation Board, Report Volume 1, August 2003. NASA JSC Safety and Mission Assurance Qualification Training Program, Columbia Case Study Course No. BA-601, by Gary W. Johnson/SAIC, February 2008. JS-2011-025 “JSC Safety and Mission Assurance Space Shuttle Program Legacy Report”, October 18, 2011. NASA’s Implementation Plan for Space Shuttle Return to Flight and Beyond, Volume 1, Revision 1.1, November 20, 2003. Gary W. Johnson is an Aerospace Safety Consultant, currently working for J&P Technologies. He worked for NASA on the major manned programs from Apollo on since 1964. He served as Manager for the Sequential Subsystem for the Apollo CSM, Lunar Module, and Skylab CSM; member of ASTP Working Group 4; first Space Shuttle flight Orbit Flight Control Team Electrical, General Instrumentation, and Lighting (EGIL) flight controller; Mission Operations Directorate Systems Division Mechanical and Payload Systems Branch Chief and Guidance and Propulsion Systems Branch Chief; Deputy Director, SR&QA Office; NASA/Mir Program Joint Safety Assurance Working Group Co-Chairman; deputy director of Russian Projects SR&QA; and NASA Co-Chairman of the International Space Station Program Joint American Russian Safety Working Group. This article was originally published in Space Safety Magazine Issue 6 Winter 2013 in commemoration of the 10th anniversary of the loss of Columbia and all its crew. This article failed to indicate the cause of the STS thermal tile fragmentation was due to the discontinued use of the ‘freon’ based foam on the lox tanks to make it ‘environmentally safe’ . NASA was negligent in making the trade relative to the worse case event of the environmental impact of sts disintergration due to the damage as occurred on the columbia.